What do you think of when you picture a landscape burning to a crisp all around you? Perhaps you might think of imagery likened to that of the Biblical Apocalypse, which was also touched upon by the comedy film ‘This is the End’ in 2013. However, the events currently unfolding are less than fun and are downright dangerous, with high winds carrying these mysterious wildfires across the state of California, causing destruction and havoc from Anaheim all the way up to Napa Valley. Thousands have fled their homes, at least 17 are confirmed dead, and 100 people are injured in these latest and most serious bouts of wildfires that the state has seemingly ever seen. 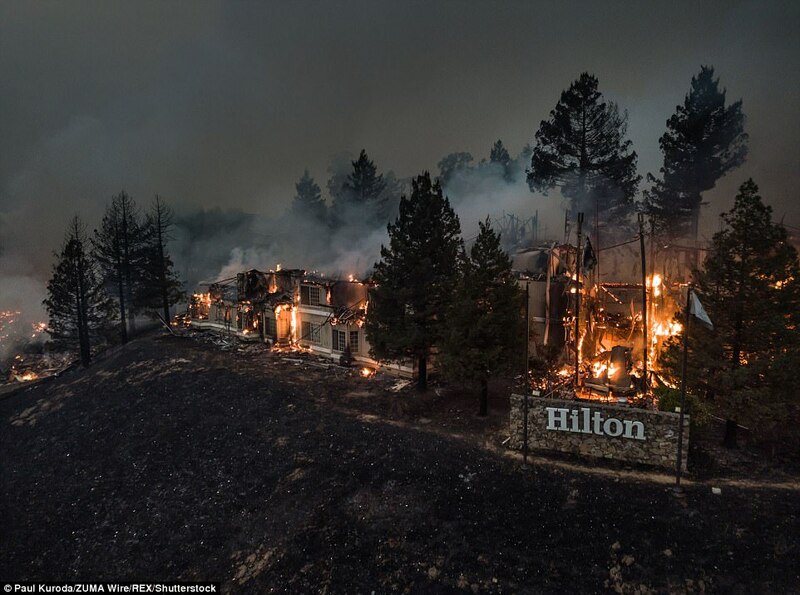 A Hilton Hotel has burned down in Santa Rosa, and the town has all but been reduced to ashes. A fire chief in Sonoma County said that all the resources have nearly been used, but it’s not been enough. California governor Jerry Brown has declared a state of emergency for Sonoma, Napa, and Yuba counties, with a surge of wildfires carried by strong winds emerging on Monday, with fourteen separate fires reported. 1,500 homes and businesses have been destroyed since the fires began on Monday evening. The wildfires started sweeping across the California wine country, sending thousands of people fleeing for their lives. 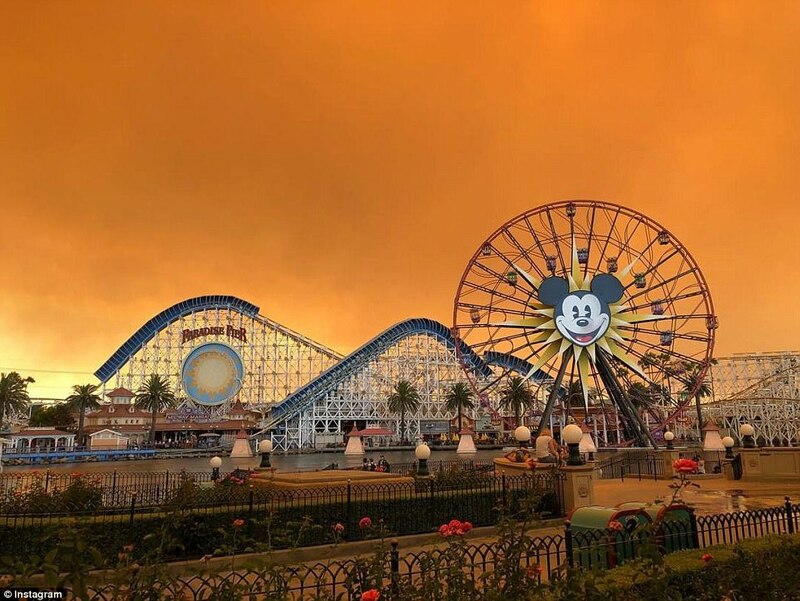 The sky above Disneyland turned a bright orange, which made it look like a scene straight out of a horror film, no thanks to the winds blowing over 50mph, stretching over a 200 mile region north of San Francisco. That’s from Napa in the south to Redding in the north. These flames also caused havoc and damage in the south, with homes in Orange County burning down, as well as Anaheim being in the path of the flames. This isn’t an isolated incident, as this map of all the separate fires now prove, courtesy of Google Maps. The cause of the start of these wildfires has not been confirmed, nor known at this stage. It seems suspicious and quite deliberate to us, but hey, that’s just us talking. Regardless, the winds are said to be fanning the flames onto new pastures. There’s something eerily inconsistent with so many wild fires raging across California at the same time, don’t you think? More than 300 firefighters have been deployed to fight the flames, with 57,000 acres already being destroyed, leaving 50,000 people without power in the regions affected by these horrendous wildfires. The ferocity of the flames has made the fire rescue teams focus more on evacuation and rescue, rather than beating the out of control fires with the resources available to them. Some of the largest fires are present in the Napa and Sonoma counties, sending smoke about 60 miles away to further south of San Francisco. Ken Pimlott, the director of the California Department of Forestry and Fire Protection, said firefighters are more concentrated on saving lives than fighting the flames. And, who can blame them? 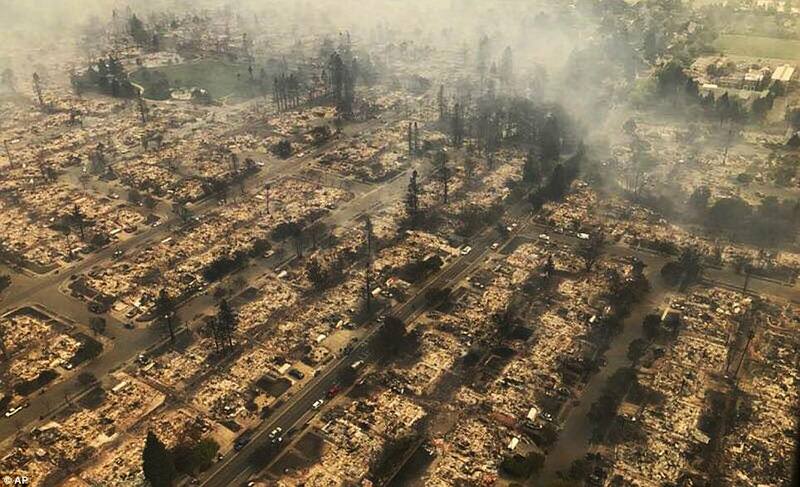 Santa Rosa, a community with a population of 175,000 have been hit hard, losing their Hilton, K-Mart, and thousands of homes in the area, with Ron Dodds of KTVU saying: “there is chaos ensuing. It’s a scary time. It looks like Armageddon”. This year alone 6,744 wildfires have burned 731,260 acres, and a GoFundMe page has started to raise money for the Napa and Sonoma relief efforts. The question now is how many wildfires can start at the same time, in so many different places and over such a huge canvas of California? That’s the mystery, and whilst people lose their homes and with others dying, one wonders what and who is the cause of all this chaos? To simply state that these fires are only a causation of natural causes seems crazy, and we sincerely hope that this isn’t the case, but one cannot dismiss that there could very well be foul play at work here. Let’s hope that the firefighters and rescue teams can quell the flames and rescue/evacuate the people that are unfortunate enough to be within range of these wildfires, before it’s too late.